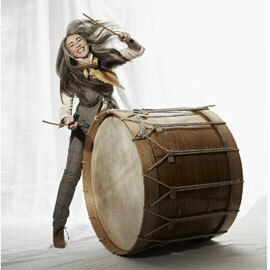 WATERLOO – Triple Grammy Award winner solo percussionist Dame Evelyn Glennie and the Manitoba Chamber Orchestra will perform at Wilfrid Laurier University Oct. 6 in the Maureen Forrester Recital Hall on the university’s Waterloo campus. Glennie will be also be working with Laurier music students on Oct. 7 from 10:30 a.m. to 11:30 a.m. in a public masterclass in the recital hall. Glennie is a world premiere solo percussionist, motivational speaker, writer, jeweler and arranger, and has been profoundly deaf since the age of 12. Glennie’s solo recordings, consisting of over 30 albums, are as diverse as her career onstage. A leading commissioner of new works for solo percussion, Glennie has more than 200 pieces to her name from many of the world’s most eminent composers. A triple Grammy Award winner and BAFTA nominee, she has received over 80 international awards to date, including the Polar Music Prize and was named to the Order of the British Empire in 1993 followed by Dame Commander of the British Empire in 2007. Glennie lives in Cambridgeshire, England. The Manitoba Chamber Orchestra (MCO) is “Canada’s tiny, perfect chamber orchestra.” Established in 1972, the MCO presents nine concerts annually in Winnipeg, featuring guest soloists who present an accessible, eclectic repertoire. The orchestra boasts a roster of some of the finest orchestral musicians in Canada and has been praised by the Ottawa Citizen for its “satiny sound…dynamic subtlety, and an impeccable sense of ensemble” and called “an excellent string ensemble conducted with crispness and verve by Anne Manson” by the San Francisco Chronicle. The concert will be held Thursday, Oct. 6 at 8 p.m. in the Maureen Forrester Recital Hall on the university’s Waterloo campus. Tickets are $30 for general admission, $20 for seniors and arts workers and $10 for students. Purchase tickets. This concert is presented in partnership with NUMUS. For school groups interested in attending the masterclass, contact concerts@wlu.ca.